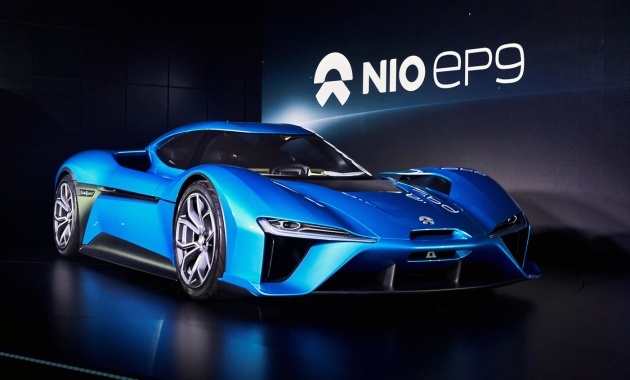 China-based company, NextEV was reported to be working on an all-electric, 1,000+ hp supercar, and here it is – the Nio EP9. It brings a formidable Nurburgring lap time with it: 7:05.12. This makes it the quickest electric vehicle to lap the Green Hell, surpassing Toyota’s PV E002 lap time by 20 seconds. It even puts some track-oriented road cars in the shade, including the Nissan GT-R Nismo which clocked a 7:08.69 lap time, and the Dodge Viper ACR which managed a 7:12.13 lap. The Nio EP9’s remarkable performance is attributed to its 1,000 kW (1,341 hp) output from four electric motors, each with its own gearbox. Zero to 100 km/h is done in 2.7 seconds, 200 km/h in 7.1 seconds, onwards to a top speed of 313 km/h. Batteries provide charge for a claimed range of 427 km. The batteries are side-loading units which appear somewhat similar to a single-seat race car’s side pods, and are interchangeable in eight minutes. Charging takes 45 minutes, and the system operates at 777 V.
Each of the EP9’s four motors are mounted inboard for “fast cornering and track stability,” with each motor producing 1,480 Nm of torque from standby all the way to 7,500 rpm. At each corner, too, are bespoke brakes built in partnership with Alcon, said to achieve twice the brake torque of a GT3-class racing car’s. Brakes are six-pot calipers biting down on 408 mm composite discs front and rear. 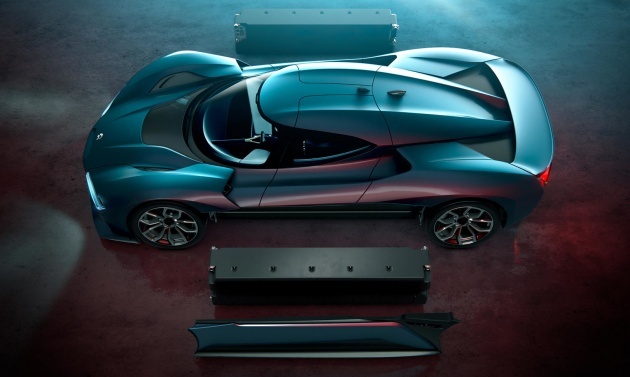 A Nio-designed suspension system – appearing to use a racing, pushrod-style layout – employs four-way adjustable dampers, and a hydraulic actuator is tasked with maintaining a consistent ride height during 3G-load cornering. All of that hangs off the EP9’s carbon-fibre chassis with a rated torsional stiffness of 30,000 Nm/deg, with the bare chassis alone weighing 165 kg. Inside, the EP9 cabin takes on a very minimalist aesthetic, with a quartet of display screens providing the driver and passenger with information. NextEV hasn’t put a price tag on the EP9 just yet, but considering the performance on offer and earlier speculation, the all-electric hypercar could be priced at $1 million (RM4.4 million) or more. hopefully they’ll do extensive testing including battery test thoroughly…kudos to China. Most of the electronic device like smartphone and laptops are made in China, did it explode? For your information, exploded Samsung battery was made by Samsung SDI. In fact, it is believe that the cause of explosion was due to the design. Come on, friends, don’t always think that China can only produce low quality products. It is actually because we Malaysian are willing to pay little only. You pay peanuts, you get monkeys. By the way Tesla’s objective is to change the automotive world, to use renewable energy instead of fossil fuels. Tesla’s are not meant for racing even though it can tapao other sports cars. Definitely different objective from this EP9. Most if not all people will NOT believe CHINA can develop its own Super-car let alone a Hyper-car & this also a EV Hyper-car. Until & unless this is verified by some motor expert in the industry, no one will believe it. If this is proven to be true, the American, British, German & Japanese will have to eat humble pie & learn a thing or 2 from the sleeping Giant. Why don’t they start at Le Mans (or 24hrs of Nurburgring)? Then people will believe. Yup, I’m impressed with that kind of Nurburing time. It is #3 of all car types and #1 for electric with the penalty of battery weight! Most of reputable electronics brand’s batteries are designed by the company themself, only production by china.. Hopefully for this one they use battery by toshiba and the likes. but with whopping price like that made by unknown china company of nowhere, good luck! each motor producing 1,480 Nm of torque? What is the purpose, it is not destined for the mass-market or something NEW AND INNOVATIVE. To me, it is just another “I can do also syndrome”.